Earlier today Major League Gaming did a draw show to pick the pools for the upcoming CWL Vegas Open. The Call of Duty World League Vegas Pools are out now with the draws finishing up. Here’s what we get to look forward to. The Vegas Open will be happening between 7 December 2018 – 9 December 2018. Black Ops IIII is the showcase game and many of the pro teams have spent enough time together to prepare for this tournament. There are four POOLS; A, B, C, D. Each POOL holds 5 spots. Today’s Pools draw was for the top 3 spots which consisted of teams from the 2018 CWL Pro League Stage 2. Teams showcased here have to retain three of four players from their roster and cannot change the players around. If a team is not able to retain three of the four players from their roster, they will be replaced by teams with the highest amount of combined CWL Pro Points from the WWII season. 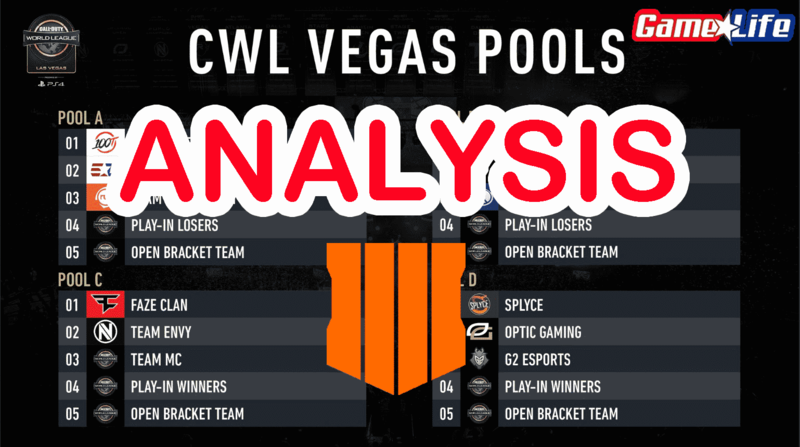 The Play-In and Open Brackets teams will be determined at a later date as each need to be played out; for example, the Play-In event will happen on Dec 6th to determine the final four pool play teams for the 2019 CWL Las Vegas. Let’s go a head and break down the pools. In Pool A we have EUnited coming back after an 11th place finish at the CWL Anaheim Open 2018 tournament. Their team in Anaheim consisted of Arcitys, Prestinni, Clayster and FeLo. The only member who left the team was FeLo (joined Evil Geniuses). New commers are JKap and aBeZy, both who bring extensive experience from past CWL tournaments. 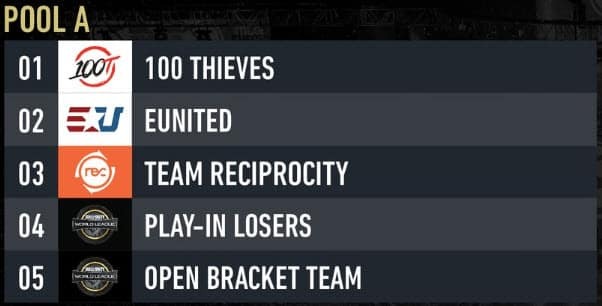 New comers are 100 Thieves and Team Reciprocity. Both will be entering the Call of Duty scene for the first time. 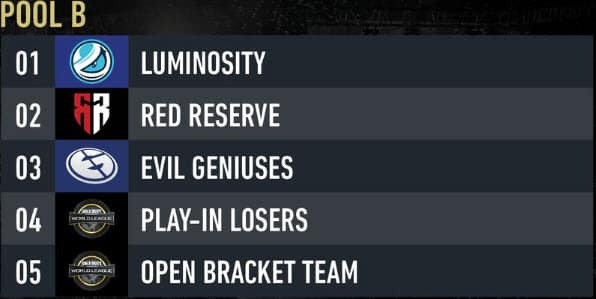 Team Reciprocity entered the Halo scene in 2017 and had decent placements. Reciprocity will be getting into CWL for the first time, however, their line-up consists of experienced CWL players which will help the team make an first-time impact in Vegas. The line=up conists of: Wuskin, Tommey, Zed, Seany and Denz. 100 Thieves will also enter the Call of Duty scene for the first time. Prior to this, they’ve only participated in League of Legends tournaments having some great success early on. 100 Thieves made the news when musician Drake jumped on board and became a co-owner. They’ve gained a lot of awareness since then and people will be curious how their Call of Duty division will perform. Their line-up for CWL Vegas will be: Kenny, Fero, Octane, SlasheR, and Enable. Pool B looks to be the pool of death as 2 of the 3 teams have finished 2nd and 3rd place in the CWL Anaheim Open 2018 tournament. Luminosity had huge success at the Anaheim Open finishing 3rd with players Slacked, JKap, John and FormaL. Luminosity collected $32,000 in prize money for 3rd place. They will be coming back even harder at the Vegas Open. Current line-up consists of: Gunless, John, Formal, Slacked, and Classic. Red Reserve has huge success as well. Lead by Joee, Rated, Zer0 and Skrapz in Anaheim, the team collected $48,000 in prize money. Red Reserve played Rise Nation in the finals losing 3-2. The games were close and Red Reserve came close to victory, but Rise Nation held strong for the win. It was an incredible finish and although watching the final clip will open old wounds, it’s a good motivator to never lay down and keep going. Red Reserve has some new faces and their current line-up looks like this: Gordo, Sebsyo, Joe, AlexGLogics, Dominate. 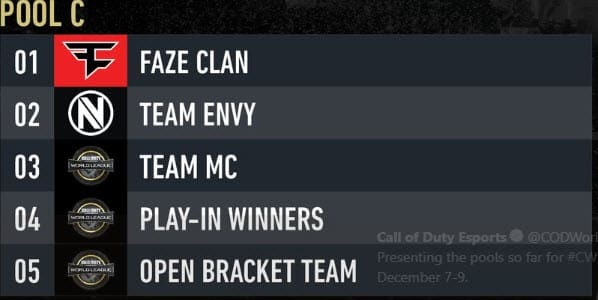 Pool C looks to be an easy pick with Faze Clan and Team Envy. Faze Clan had an impressive finish at the CWL Anaheim Open 2018 tournament finishing in 5th place and pocketing $8000. Faze, being one of the oldest organizations in the league has had solid finishes in all their Call of Duty participation. Lead by ZooMaa, Attach, Crowder, Priestahh, Methodz and FCM (manager) they’ve been playing with each other since 2017 collectively. Faze Clan will be one to look out for. Team Envy, formed in 2007, was created as a Call of Duty esports team. Although they finished in 16th place at the Anaheim Open, their past success is something to take notice. Noticeably at the Chamiponship stage they’ve been one of the best teams in the world finishing top 2 most of the time (1st place finish in 2016 CWL Championship and 2nd in 2017). Currently lead by ACHES, Apathy, Assault, SiLLY, Huke, Bevils, they will be looking to get back into the CWL scene and shake things up. In Pool D we have some familiar faces; Splyce and OpTic Gaming. Both who had good finishes in CWL Anaheim Open, but will be looking to improve their placement. 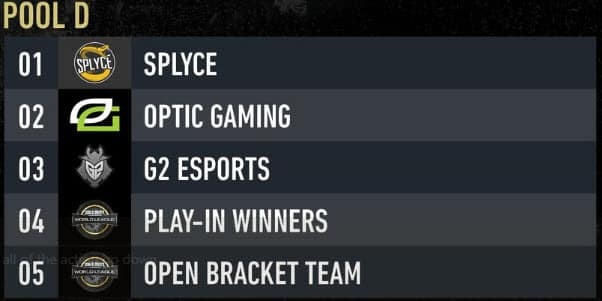 In 2018, Splyce were the runners-up in the 2018 CWL Birmingham Open which was the 4th Major International offline event for Call of Duty: World War II. Their last bout in Anaheim had them finishing 10th place which is very good. Their current line-up consists of Jurd, Accuracy, Loony, AquA and Temp, a completely different line-up compared to their roster in Anaheim which consisted of Bance, Jurd, MadCat and Joshh. Jurd, being the original member will most likely take the lead at the Vegas Open. Splyce’s new line-up in solid and will be looking to make headlines. G2 Esports is a Spanish esports team based out of Berlin. 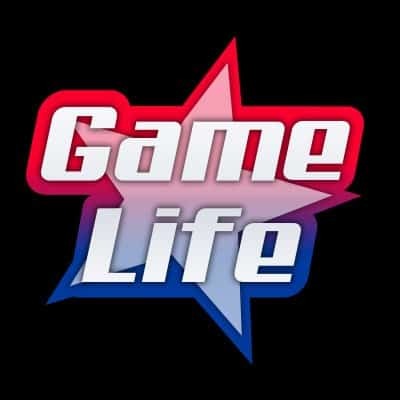 They have teams in League of Legends, CSGO, Rocket League and many more. However, they will be new entering the Call of Duty world. Their roster consist of Blazt, Chino, Decemate, Faccento and Ricky. It’s unclear who will be the starting 4, but one thing for sure is that their line-up consists of players who’ve been to many CWL tournaments and hold a lot of experience. They will be a team to look out for. Last but certainly not least is OpTic Gaming, who finished 6th place at the Anaheim Open were lead by Scump, Crimsix, Octane and Methodz. OG, being one of the most popular esports teams are always heavy favorites to win a tournament. Their rurrent roster consists of Scump, Crimsix, Karma, Dashy and TJHaLy. Finishing in 6th earned OpTic Gaming $8000 in prize money. Their most solid performance this year came from CWL Pro League 2018 Stage 1, where they finished in 2nd place, earning $132,500. OpTic Gaming is always a team to look out for, especially with Karma joining the team again few months back and having Scump and Crimsix lead the way. TJHaLy is also a new edition, joining the team the same day as Karma and brings extensive experience in the Call of Duty realm.